oin us for fun and informative Guided Tours of The Barbados HISTORIC GARRISON AREA,conducted by knowledgeable, multilingual guides, in a comfortable air-conditioned coach. The Barbados Historic Garrison Tour is an exciting excursion which allows you to travel back in time, in air-conditioned comfort, through Barbados’ Historic Garrison, now a UNESCO World Heritage Site. This magnificent site dates back to around 1650 and is home to what is thought to be the most intact, and authentic 18th and 19th century British Garrison complex in the world. ...Learn how the history of the Barbados Garrison was influenced by Cromwell, George Washington, and The American War of Independence! ...See where a young George Washington, in 1751, was exposed to British military strategy as he visited and inspected the nearby ‘Charles Fort’ (1650) and ‘St. Ann’s Fort’ (1707). 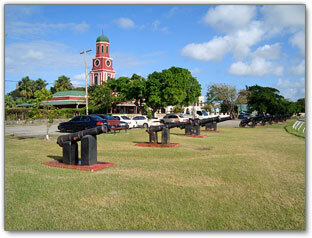 Enjoy the Military History of Barbados from 1640 to Today! A visit to the famous George Washington House (c1720) where young George spent 6 weeks of life. See and experience the re-discovered ‘Garrison Tunnels’ (c1820). A visit to Charles Fort, built to protect Carlisle Bay; the harbor that received slaves from Africa and provided an exchange of precious local commodities, such as tobacco and sugar, for the materials required to develop this strategically located island. A visit to The National Armoury Museum; a former Powder Magazine (c1800) which stored the gunpowder for the British fleet anchored in Carlisle Bay at the time and which now houses for the World’s finest collection of 17th century English iron cannon. A visit to the (still functioning) Officer's Mess at St. Ann’s Fort for a drink (Fruit punch or Rum punch). A stop-off at ‘Changing of the Sentry’ exercise (the Barbadian version of the Changing of the Guard at Bucking-ham Palace) at the Main Guard (1804). This exercise is carried out by 15 men in full ceremonial dress, wearing the uniform selected for the West India Regiment by Queen Victoria in 1858. BOOK NOW and Secure your space! Flat trail with two minor inclinations, using mainly paved surfaces. This will be a somewhat replica of the mule-driven tram that operated up to 1925 in Barbados. Motor-driven trams will be driven around the Garrison Savannah, down to Bush Hill and then to the Hilton/Needhams Point, and return. Send Barbados Historic Garrison Tours Postcard to a friend!